What: The Steel travel to the desert to face the Rattlers. When: Friday, April 30 at 6 p.m. (PT). National Media: TV - CBS Sports Network. This season: April 1 - Steel at Rattlers 80, Steel 28. June 11 - Steel at Rattlers. Series History: Regular Season - Rattlers lead 6-0 (3-0 away). Playoffs - Rattlers lead 1-0 (1-0 at home).. Note: These teams met in this year's season opener, with the Rattlers winning 80-28 in Portland. The Steel are in 0-3, 0-2 on the road and 0-1 in conference play. 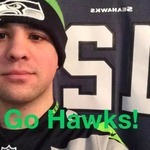 They are coming off an 70-32 road loss to the Philadelphia Soul on April 17. They are averaging 37.7 points per game (7th in the AFL) and are allowing 67.7 points per game (8th). First Downs per game - Steel 12.3; Rattlers 23.2. Yards per Game - Steel 268.3; Rattlers 289.5. 3rd Down Conversion - Steel 37.5%; Rattlers 69.6%. 4th Down Conversion - Steel 61.1%; Rattlers 33.3%. Total Tackles - Steel 62; Rattlers 129. 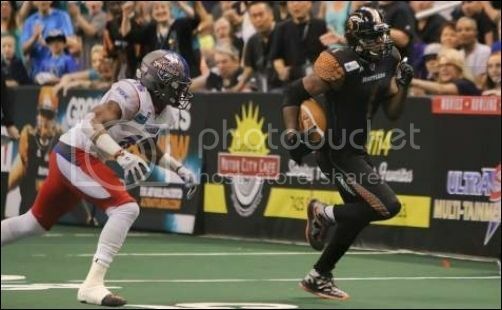 Tackles for Loss - Steel 6; Rattlers 113. Total Sacks - Steel 3.0; Rattlers 10. Fum Rec - Steel 2, Rattlers 5. Interceptions - Steel 0, Rattlers 7. Had Intercepted - Steel 5, Rattlers 2. Note that the Steel have played three games, while the Rattlers have played four. Some organizations have a "Star Wars" game night promotion. This week, the Steel might want to try a "Back to the Future" promotion. The franchise's first quarterback is back in a Portland uniform for the first time in nearly a year, replacing the now-departed Danny Southwick. 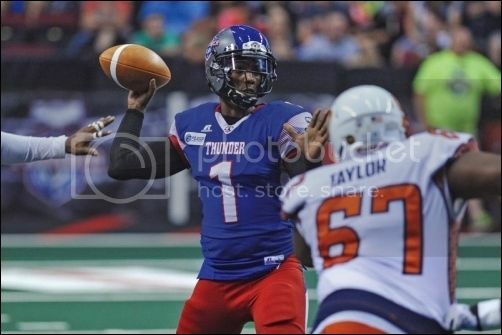 Thomas had a rough start to his AFL career with the expansion Portland Thunder in 2014, but seemed to have turned a corner before going down to a leg injury in week 9 of the 2015 season. Make no mistake, this will once again be Thomas' team, as the Steel look for their first win of the season, and first win ever over the Rattlers. Whether Thomas possesses the tools to hold down the position for the team, or if this is simply a publicity stunt to bring in the former Oregon Duck in order to fill seats remains to be seen. Tom Gilson has been the most consistent Steel receiver thus far in 2016, snagging 30 passes for 299 yards and 4 touchdowns (12, 128 and 1 respectively in week 1 against the Rattlers). Jared Perry is a nice compliment, with 23 catches, 287 yards and 5 touchdowns (8, 117 and 1 respectively against the Rattlers). With Jabin Sambrano being place on inactive reserve, it will be up to either Rashaad Carter or Tyrone Goard to emerge as the number three receiver. John Collins is solid at center, but the offensive line has struggled to protect the quarterback, so the Steel traded for Duke Robinson. The defensive line has struggled to get to the quarterback, but will look to change that this week. The Steel's defense has yet to record an interception this season. They will need to play nasty and be opportunistic, and disrupt a potent Rattlers offense. That, and cutting down on penalties, are the keys to the game for the Steel to be competitive in this game. Player to Watch: Darron Thomas (QB). Wild Card: Rashaad Carter (WR). Say what you will about the widespread reports of Rattlers players being paid under the table, this team is a veteran unit and will only get stronger as the season goes along. What you have with this team are experienced players who have been lining up alongside of each other for several years. It all starts with Nick Davila, a.k.a the Latin Laser. He has lost a bit of a step, but is still one of the better receivers in the league. He is completing 72.1 percent of his passes en route to 951 yards and an AFL third-best 25 touchdowns (heading into this week) against just 2 interceptions. He went a modest 10-16 for 119 yards and 5 scores in a week 1 against the Steel in a game where he was never really tested. Rod Windsor leads the receiving corps. He caught 7 passes for 86 yards and 4 scores in the Rattlers' week 1 win over the Steel. He leads the AFL in all major receiving categories; receptions with 48, yards with 543 and touchdowns 15. He is an explosive receiver who knows how to get open. Chase Deadder, Kerry Reed and Maurice Purify are all excellent complements to Windsor in the receiving corps. Mykel Benson leads the AFL with 9 touchdown rushes and is always a threat in goal line situations. The Rattlers defense is stout, scoring four defensive touchdowns Damien Borel had two fumble recoveries and a pair of sacks in that game. Dimitrio Tyson and Luis Vasquez each had two sacks, while Arkeith Brown and Reed each intercepted a Southwick pass in that meeting. There is not a lot to question on the field when it comes to the Rattlers. The key for Arizona to win is simply to run their offense and protect the football. Player to Watch: Nick Davila. Wild Card: Rod Windsor (WR). “We want to get better each week. We don’t want to revert. And I think in some ways we reverted in our last game (at Philadelphia). We got off to a slow start, for whatever reasons — a couple weeks of long travel, the time zones included. 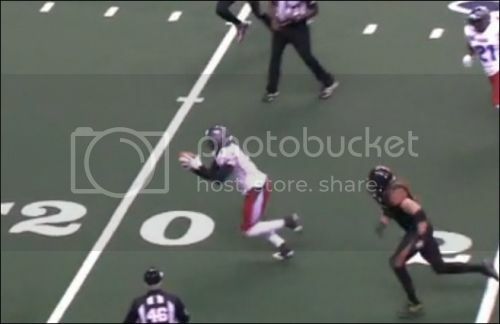 April 29 - Orlando Predators at Cleveland Gladiators, 4 p.m.
May 1 - Jacksonville Sharks at Tampa Bay Storm, 11 a.m.
During Portland's first-ever AFL playoff game, on August 3, 2014 against the Rattlers, Kyle Rowley started at quarterback for the team. Due to injuries, then-head coach Matthew Sauk elected to start Darron Thomas at jack linebacker. Thomas recorded 3 tackles and intercepted this Nick Davila pass and ran it back 23 yards for the pick-6. The Rattlers would hold on to win the game, 52-48. The Steel will be looking to give Ron James his first win as head coach, during his birthday week. James' birthday falls on April 28. Hopefully the Portland that took Orlando to the limit is the team that shows up tonight. If not... it's gonna be a long game. Unfortunately. I didn't know Darron Thomas played linebacker in the playoff game. That's hilarious! This might turn out to be an ugly game. I hope we can improve and get better as it goes along. this will be an uphill battle. hopefully they play better than they did in the opener. Kasey Peters -- NOT Darron Thomas -- will start the game for the Steel. Thomas is "not ready to go" so Peters will start at QB for the Steel. 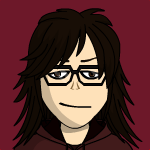 i think Kasey Peters has some split ends! Hey Portland peeps & co. Watching this Sox/O's game and checking out the boxing going on Fox some too, then maybe food after, so might be missing a lot of this game. Hopefully can come in and catch the second half. But yeah, could be a rough game and over by that point... You all get CBSSN to watch? Either way, hope for a miracle and they make a good game out of it that you can enjoy some! Come back later if I can, have fun. Touchdown Steel. Tyrone Goard 12 yard pass from Kasey Peters. Ernesto Lacayo kick. We all are watching in various places! Touchdown Rattlers. Rod Windsor 48 yard pass from Nick Davila. Kenny Spencer kick.